In a large bowl, mix eggs, milk, cinnamon, salt and vanilla. On a plate, add corn flake crumbs and sugar, and mix well. Preheat a large skillet on medium-low heat. Add bread to egg mixture and let soak on each side for about 60 seconds. Remove from egg mixture and thoroughly dredge through corn flake crumbs. Add 1 tablespoon butter to skillet and add bread. Fry until golden brown on each side, about 2-3 minutes each. Repeat with additional bread, using remaining tablespoon of butter for the next 2 pieces. 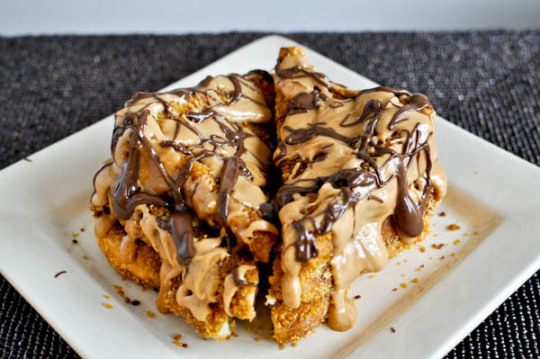 Top french toast with melted peanut butter and chocolate. Devour! and an interesting link / source too - thank you.